Eagle Engineering is a team of student engineers working together to promote science, technology, engineering, and math applied through spirited robotics competition. We stand for duty to service, an energetic work ethic, creative design, and excellence through teamwork. Our goal is to help in developing the next generation of leaders, innovators, and scholars instilled with character and respect for their fellow man. We have two seasons of competitions throughout the year. 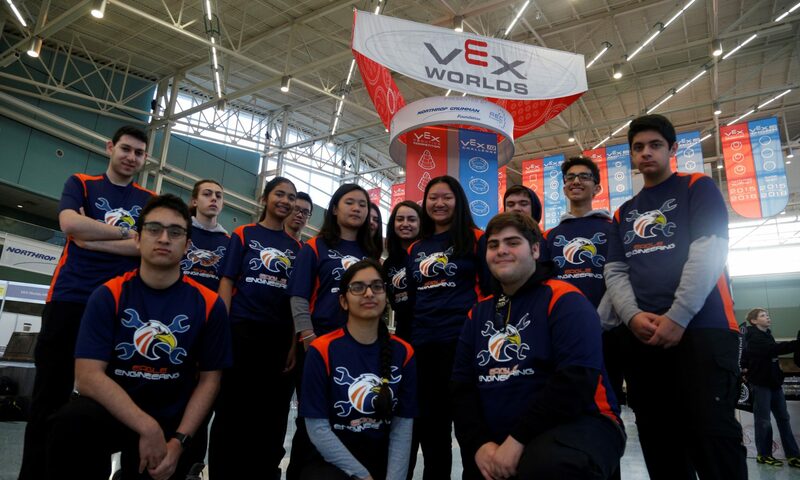 VEX Robotics holds tournaments year-round at the regional, state, and national levels which culminate at the VEX Robotics World Championships in April. The FIRST Robotics Competition uses a standard “kit of parts” to build a robot within six weeks to compete in a game more complex than the VEX season. Both games change every year and present a new challenge to students and mentors alike. We are very grateful for the opportunity to explore and expand our knowledge in STEM. Being so, we contribute our efforts to spreading STEM in the local and global communities. We volunteer with organizations like The Girl Scouts of America and the Children’s Institute Inc. to inspire and ignite a flame in the minds of young leaders- soon to be the future innovators of the world. Come volunteer with our team and have fun meeting people in the robotics community!